I’m not sure I’ve ever been so frustrated with a video game before. Not because of the quality of the game itself, Bad North is brilliant, but because of my own stupidity or lack of forward planning. I can’t count how many times I yelled at my Switch for the tiny warriors inside the screen to move faster or hit harder. My Pikemen were rarely in the right position, the sword and board fighters were always a pace too slow for my liking and the less said about my archers, the better. But it never stopped me loving each useless captain and their squad, it didn’t hurt less when they died, gone forever. It would be nice to be able to rename my units or change their colours and it would be lovely if the randomisation didn’t occasionally screw me over though. Because sometimes it does. I’ll be a few islands in with four full squads and suddenly big hulking Vikings appear at the coast intent on destroying everything in sight. My puny teams all fall in and move to the squares I’ve assigned them only to be flattened, not because of position, but purely because they weren’t tough enough to take the battering. Of course, this could also be my fault for not calling them into a nearby house to heal, replenishing the squad. It’s hard to know when Bad North is being difficult or when I made an error. The game is so delightfully simple that any loss always feels like the fault of the player. Like Chess, this game is about forward thinking, anticipating the path that enemies will take. Their goal is plain; pillage and destroy the randomised islands you call home. Your goal is to defend it. Some islands will only feature one coastline, so when they disembark the boats you’re waiting to slaughter them. Others are surrounded by coastlines, but also feature hills and multiple pathways, meaning that positioning is key to defence. However the island looks, success comes down to strategy. The starting islands are always relatively easy which allows for the successful defence of the buildings. The bigger the building, the bigger the reward of gold coins which are used between islands to upgrade your teams and assign them classes. A maximum of four squads can be used so choosing their class is important. You don’t want lots of archers as they can’t defend themselves in melee combat; Pikemen are great for holding a point but can’t attack and move at the same time. It will take a few games to get used to how each class moves and how you can utilise their special attacks – also acquired with gold. Archers can gain the ability to rain down more arrows onto a target, where swordsmen can leap from cliffs down onto enemies for a more powerful blow. There are items that can buff your squads in times of need, too, but without thinking about routes, pathways and bottlenecks, it’s all for nought. Game over is reached a few ways and you’re more likely to see that than a successful campaign for a while. If your squads are wiped out, you’ll have to start again and the same goes for if the Vikings manage to overtake your progress through the islands. Because as they move, you’re trying to stay ahead of them, much like in games such as F.T.L. We see a map of islands and are shown where the Vikings are, it’s up to you to decide whether to head out to a more distant island for the chance of a new captain or item that may help, but then danger gets ever closer. Everything in Bad North is a fine balance and thankfully the control system is designed to perfectly emulate this. The sticks focus on movement of the cursor and camera, while the L and R Buttons cycle through your teams. You can use the touchscreen if preferred, but either way, the game feels intuitive. 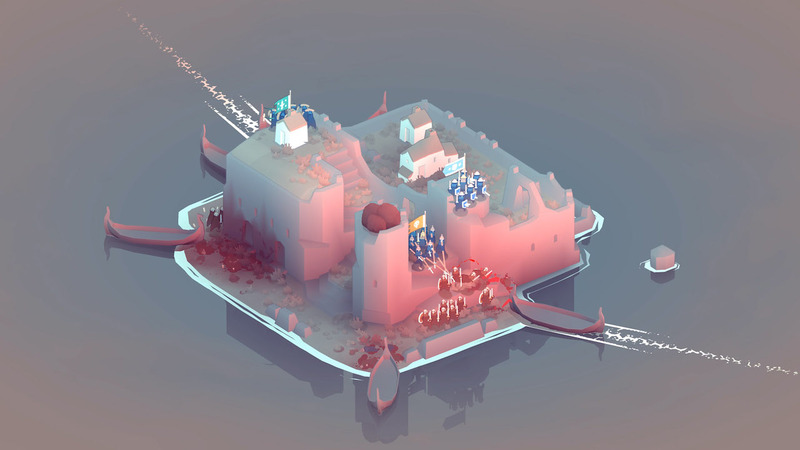 Everything about Bad North screams streamlined, even the visuals. Using low poly graphics is the norm for so many indie developers nowadays, but it suits this game wonderfully. The enemies are depicted as evil through the use of stark black and white shapes, whereas your teams are lit up in bold colours. Spurts of blood pop from the screen, a great indicator of damage dealt and when the Vikings storm your lands and set fire to houses, the game takes on a haunting quality. For a title that doesn’t push the Switch, it manages to look stunning at all times. One of my more recent games saw a lot of wind and rain surround my islands giving off a very desolate feel, making my teams feel ever more isolated. The level of personality and character communicated through very little is a sheer wonder.